How many of you can say that you know the magnificent band called Armored Saint? Here in Finland there are not many who know the band, but I hope the amount is larger globally. Armored Saint is a band from California, USA, that to me, when it comes to metal, defines the term “old school” in every sense. No machines, no samples, no fancy keyboards, THIS is pure balls out metal, 80s style! The lead guitar work of Jeff Duncan and Phil Sandoval are straight in the vein of Maiden and Priest; strong drumming on behalf of Gonzo Sandoval; crushing rhythms that shift from hard rock to heavy metal to straight out thrash; bone-shaking basswork by Joey Vera and everything topped off by the very strong vocal work of current Anthrax bellower John Bush. His voice recalls the gruff howl of Tom Araya to me, with a touch of Bruce Dickinson thrown in the mix. Being a fan of the lower, more bassier singing power of the metal world, he is one of the finest vocalists I have ever heard. Hey, Bush was even asked to join Metallica in the 80s, but he declined. If that isn´t a mark in your resume, I don’t know what is. AS released their debut album in 1983, when original guitarist Dave Prichard was still in the band. But during the recordings of Symbol, he was diagnosed with leukaemia, which drained him to the unfortunate end before this album could be released. People say that great art often is born from tragedy, and here is one proof. The album is of course dedicated to Prichard. To me SOS is Armored Saints finest moment. I can also recommend all of their earlier catalog, especially Raising Fear and Delirious Nomad. Check them out too. But now to the song material. You have only time to press the play button when Reign Of Fire punches your teeth in with a killer riff and an absolutely awesome chorus. The solo trading of Duncan and Sandoval rips the mind to shreds on many tracks on the record, but especially on the opener. Dropping Like Flies continues the harvest as more metalheads fall down to bow down. Last Train Home is a more hard rock-like tune, with great melodies and a little slower pace, but it still is one of the finest tracks on the album. Tribal Dance begins with nice tribal drumming (WOW, bet you didn’t see that one coming after the name) but doesn´t pick up to the speed and power of the first 3 tracks. A good track, but one of the more mediocre ones on the record. The Truth Always Hurts is the second slice of hard rock on the album, even reminding me of Bon Jovi (I can hear the TRUE maniacs GASP!) in the verses. Half Drawn Bridge is a short instrumental, that was made after Prichards passing, as a special short tribute to him that works as an interlude as we come to the real gem on this album, Another Day. Great, truly uncheesy ballads are few and far in between in metal, but this one is one of the finest lighter-raisers I have ever heard, transforming from a slow ballad to a wicked rocker with a great grinding pace. Even though I am not an expert of near-death experiences, I can imagine Prichard singing the chorus in his last days among us. "But there´s a will, and my way, is roaming light. Please let me buy, Another Day, Please let me try, To find another day". Your being has only begun to wake up from the dream-like state of the previous song, when the title track of the album lunges at you with a MONSTROUS riff that does not mess around. Anyone who did not dare to mosh during the title tune, will be punished severely as the Hanging Judge begins to hammer down the sentences. All infidels are sent to the Warzone where Sandoval and Duncan shoot dizzying solos towards every soldier who isn´t fast enough to start a pit. The next two cuts, Burning Question and Tainted Past don´t measure up to the previous headbangers, and they get buried in the track list as the most mediocre songs. The albumcloser Spineless makes up for them, as the purest piece of thrash on the album. If your neck doesn´t start to hurt by the second chorus, you´re not really trying, private! All in all, this is a great album by one of the most underrated bands of the 80s metal scene. These guys should have had a LOT more success than they did, but the shift in the music scene (DAMN those greasy-hair, flannel-shirt, “think-I´ll-look-at-my-shoes-and-stand-still-while-playing-live” grunge-mongers;), Prichards death and Bushs departure to Anthrax understandably cut the path too short. But you all can still find this awesome band. 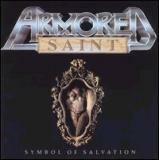 Every fan of good old 80s metal owes it to him/herself to find out about Armored Saint. Symbol Of Salvation is a very good point to start.